Dental bonding offers a permanent solution to restore your teeth without the use of highly invasive procedure. Designed to bring visual restoration to chipped, cracked and discoloured teeth, our streamlined process rebuilds the surface of your teeth. Also called composite bonding, dental bonding is a time-honoured procedure designed to repair relatively minor tooth damage. This non-invasive process transforms the surface of teeth through the application of a specialised tooth-coloured resin solution. While primarily used for cosmetic reasons, bonding also serves a functional purpose. For example, if your gums recede too far and your tooth root is exposed. Unlike porcelain veneers or implants, which are recommended for major dental reconstructions, bonding is recommended for minor repairs, such as a chipped tooth. Described as the most conservative dental cosmetic procedure, the treatment doesn’t alter much of the original tooth enamel. Tooth Decay | Instead of using metal, or amalgam, fillings, the composite resin of bondings may be used to fill cavities. Its natural-looking colouration is practically invisible when used as a filling. Damaged Teeth | The most common use is to visually repair a cracked or chipped tooth. Colour Restoration | The resin material adjusts to match your natural teeth, which makes it an ideal option to cover discoloured teeth. Close Gaps | Gaps between teeth, also known as diastema, can disrupt the aesthetic appeal of your teeth. Bonding effectively closes gaps and creates a smooth, uniform appearance. Dental bonding is a relatively swift with minimal downtime. In fact, many patients have no dedicated recovery time, which makes it ideal if you live a busy, active life. The process is minimally invasive and is completed right in your dentist’s office. The area is numbed with a local anaesthetic. However, not all procedures require an anaesthetic injection. A rubber dam, which is small sheet of plastic, is positioned in your mouth to keep the tooth dry. No saliva can be present as moisture affects the composite material. Your tooth is cleaned to remove debris, such as food, tartar or decay. A phosphoric-acid-based gel is carefully applied to the tooth, which prepares its surface by giving it a rough texture. Once the appropriate texture is achieved, your dentists applies a thin layer of a bonding agent, which is a special type of adhesive. Once thoroughly coated, the glue is “set” with a narrow beam of ultraviolet light. Once set, the composite resin mixture is applied in multiple layers. Each layer is set using the concentrated UV light beam. This layer-by-layer process ensures the ideal shape and size is met. Finally, the surface is polished and excess material is removed. If you have chipped, cracked, discoloured or damaged teeth, you have options. At Smile Gallery Dental Clinic, we believe everyone deserves a smile they can be proud of. 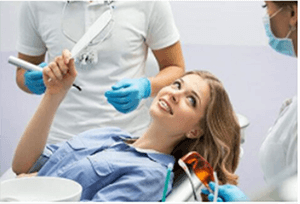 While many dentists in Box Hill offer dental bonding, few deliver this procedure with the level of professionalism, compassion and skill as our team of dental professionals. Call (03) 8595 2632 and let’s begin the process of restoring your teeth, your smile and your confidence!